There seem to have been at least two families in the tenth century in Ireland with the name O'Clerkin. One family, of the line of Eber, according to an Eoghanach Genealogy given in Manuscript 11.2.7 in Trinity College, Dublin--the Clerkins (Clereachains, Cleirchen) in Limerick were descended from Scannlan, King of the Ui Fidghenti, who died in 781 (Annals of the History of Ireland). 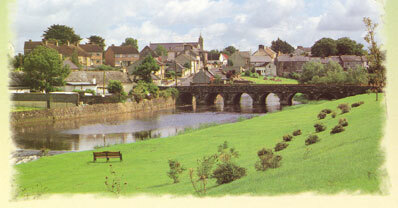 The Ui Fidgheinte, who ruled from Bruree (Bru-ree) "place of kings," on the Maigue River in Limerick, derived their name from Fiacha Fidgheinte, who was descended from Eogan Mor whose name was given to the Eoganachta who ruled in Munster, in the southern part of Ireland. The territory of the Ui Fidghenti corresponded almost entirely with modern county Limerick. The Clereachains lived in Drumain-Ui Cleirchen, Clerkin's Ridge, in the barony of Coshma, Limerick, near the present town of Dromin. They were known as "Lords of Drumin." According to the Chronicon Scotorum, in 1088, "The Connachta and the men of the North" raided Drumain h Clerchin and Brugh Righ (Bruree). According to Mainchin Seoighe in Dromin and Athlacca: The Story of a Rural Parish in Co. Limerick, "The oldest remains of human habitation in the parish of Dromin/Athlacca are the earthen forts...on which houses made of wood from the surrounding forests once stood. 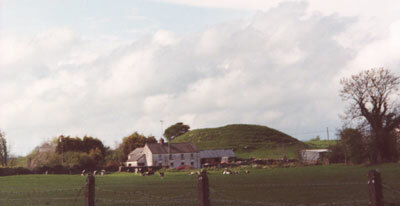 Some of these forts could possibly date from as early as 500 B.C.....The largest fort in the parish is that known as 'the Caher,' on Dromin Hill, in the townland of Dromin South. It is about 400 feet in diameter, and as its name implies, it is a cathair, that is, a stone, or stone-faced fort..." This caher and nearby ring forts, "a whole complex of earthworks, banks, fosses, and mounds," was the place of the Ui Cleirchen or Clereachain where they were rulers of a small kingdom called a "tuath." Today the caher of the Ui Cleirchen is a grassy meadow, encircled with gorse. The caher and the ring forts of the Ui Cleirchen are protected by the Government and cannot be disturbed. 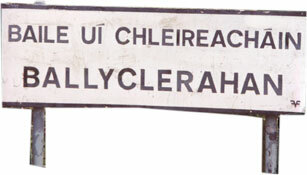 As a result of a power struggle between the Dal Cais and the Ui Fidghenti around the year 1100, some of the Clereachains moved to Tipperary where they established Ballyclereachain (Ballyclerihan) which they held until the coming of the Normans. The family who took the Clereachains' land was named "MauClerc," (another name containing the word "cleric.") which was later anglicised to "Mockler." Those Cleireachains who stayed in Limerick changed their name to Clery or Clarke. 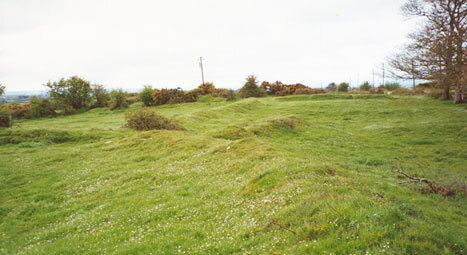 The remains of the Clerihan/Clereachain settlement still exist outside the modern village of Ballyclarahan. The other family of Cleirchen (Clerkins) were of the line of Heremon and were located in the north of Ireland. They were descended from Niall, High King of Ireland in 405 through Moain, and thus were a part of the Cenel Moain (O'Clery's Book of Genealogies, Seamus Pender, Ed., Dublin, 1951) The Cenel Moain were a part of the northern Ui Neill. Moain was a great-great grandson of Niall according to O'Clery. The Cleirchen were of the Clan Anarcc, Anarcc being a later descendant of Moain. The genealogy of these Cleirchen is: Nial, Owen (d. 465), Muirdaigh, Moan, Colman, Faelin, Edlaigh, Tendalaigh, Ferdalach, Anarcc. Both Annals mention the death of Glunairn Ua Clercen. In the Annals of the History of Ireland, he is referred to as "Glunairn Ua Clercen, lord of Ui-Cairbre," and in the Annals of Ulster, as "Glun Iarain Ua Cleirchein, King of Ui Chairpri." The Ui Chairpri probably referred to are probably the Cinel Cairpri, a branch of the northern Ui Neill in the kingdom of Breifne (Ireland History in Maps. The Breifne Region). It is possible that "Ui-Cairbre" refers to Cairbre Aoedba in Limerick, but it seems more likely that Glun Iarain Ua Cleirchein ruled in Breifne. It seems probable that Glun Iarain was a grandson of Clerchen, "son of Tighearnan, son of the Lord of Breifne," who died in 935. It is therefore possible that the Ui Cleirchen of the north were named for Clerchen, son of Tighearnan. The Ua Cleircein, who was Lord of Caille-Follamhain in Meath , in 1018, was probably of this line also. Whether the exact genealogy of the Cleirchen is known or not, they were clearly one of the ruling families in the north. There was a Cleirchen, who was King of Aileach in 993. But his lineage is not from Anarcc. It is given in Rawlinson as: Fergaile, Neill Frossaig, Aed Oirdend, Mail Duin, Neill, Donnacain, Maeli Duin, Cleirchin. So this Cleirchen is probably not the antecedant of the Clerkins. There was an earlier king in the north also: Cleirchen m. Murcadha, king of the Briuin Seola, who died in 912. He, too, does not seem a likely antecedant since Cairbre MacClerken lived a hundred years later. The O'Clerkin family seems to have left Meath after it was appropriated by the Normans and to have gone to Cavan and Monaghan (Slointte Gaedeal is Gall, Rev. Patrick Woulfe). They went to Fermanagh also, according to the 1659 Census of Ireland where the name appears as O'Clerkan, O'Clerigan, and O'Clerican. In Monaghan, it appears as O'Cleregan and O'Clerian. There was a Nial McClurkan listed in the Muster Roll for Antrim in 163l. In Special Report on Irish Surnames by Sir Robert Matheson (Dublin, 1909), it is reported that O'Clerkins are thought to have gone with the Three Collas to Scotland in the fourth century and to have returned to Ireland. It seems likely that they would have been from the Meath family. Although the O'Clerkin line of descent beyond Anarcc isn't clear, it is certain that they were part of the Ui Neill. Another possibility for the origins of the MacClerken family, however, is found in the Annals of Ulster, which list Clercen, priest of Armagh, who died in 995 and Scoliaghi MacClercen, priest of Armagh, who died in 1012. Except for Cairbre MacCleirchen, Lord of Ui Fidhgeinte, who died in 1013, the MacClerkens mentioned in the Annals are all associated with the Church, and their "Mac" name may have distinguished them from the O'Clerkins who were kings and chieftains. The earliest probable antecedent of the MacClerkens is Clercen, who was the son of Leran. What larger family Leran belonged to is not known at this time, but Scoliaghi MacClercen is referred to as a noble priest of Ard Macha in the Annals of the History of Ireland which probably means that he came from a ruling family.